Abu Dhabi: The UAE’s economy minister expects the country’s gross domestic product (GDP) to grow by 2.5-3 per cent in 2018 and by more than 3 per cent in 2019. Sultan Bin Saeed Al Mansouri was speaking to reporters in Abu Dubai on the sidelines of the UAE-Lebanon Investment Forum on Wednesday. Earlier this year, the International Monetary Fund (IMF) forecast GDP growth of 2.9 per cent this year and 3.7 per cent next year for the economy. Al Mansouri did not elaborate further on why he thinks growth will be higher next year but a senior official from the Ministry of Economy said that introduction of the foreign direct investment (FDI) law, as well as diversification of the UAE economy, will be key factors that will push GDP higher next year. The government issued the FDI law to boost the investment environment and attract foreign investment in line with national development policies earlier this year. According to the decree, issued by the UAE president on October 30, an FDI unit will be established in the Ministry of Economy to direct policy while establishing a comprehensive database on UAE investments, among other measures. Al Kait also said incentives launched by local governments such as the reduction or abolition of fees will play a positive role in increasing the country’s economic growth. Abu Dhabi last week introduced fee exemptions for all new economic licences issued in the emirate for two years. The Abu Dhabi Executive Council also approved another resolution exempting and reducing the fees of 98 basic services levied on the private sector by municipalities in Abu Dhabi. “All these developments will be very positive for the economy,” Al Kait said. 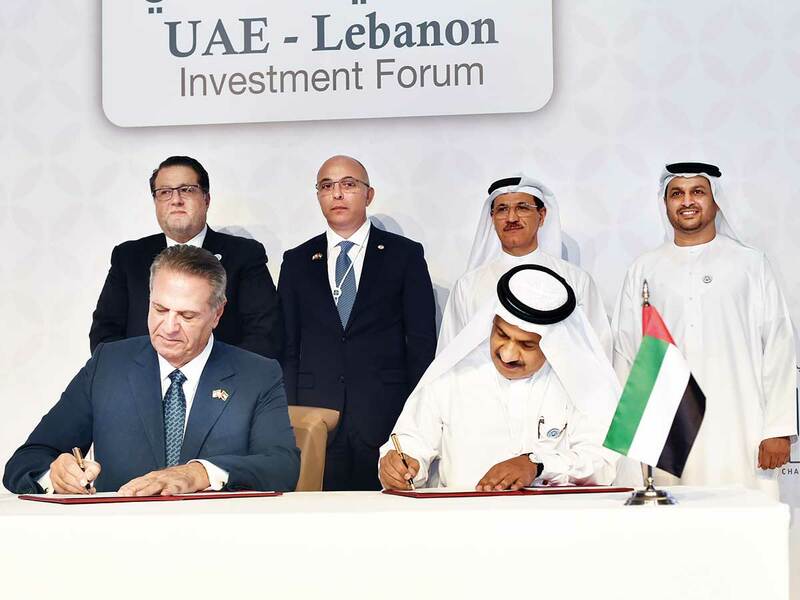 Abu Dhabi: The value of trade between UAE and Lebanon is about $2 billion, UAE economy minister Sultan Bin Saeed Al Mansouri said in Abu Dhabi on Wednesday. He also said the discovery of gas in Lebanon will help the Lebanese government to put together a clear plan for the development of infrastructure, as well as tourism and other sectors.